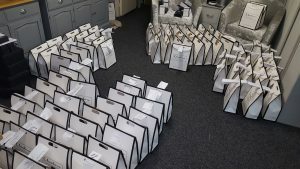 Just a couple of weeks ago, Cheshire Home Fragrance celebrated its first Christmas – it’s unbelievable to think that this time last year I was still in the process of developing the brand. My ‘little’ venture has grown to proportions the like of which I never imagined when I re-launched Cheshire Home Fragrance eight months ago. It was a year in the planning to find that niche in home fragrancing but I feel that I have well and truly established myself in recent months and I couldn’t be happier. 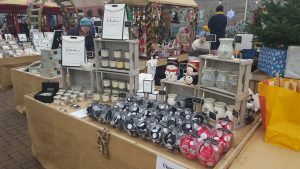 The festive time of year proved to be a big hit for Cheshire Home Fragrance; I was inundated with orders online, by phone and in person, along with bumper sales at all the events that I attended from the end of October. I hope everyone’s purchases were well received on the big day. The feedback has been brilliant – it’s what really makes this job worthwhile, so I’m extending a big thank you to all my customers near and far! 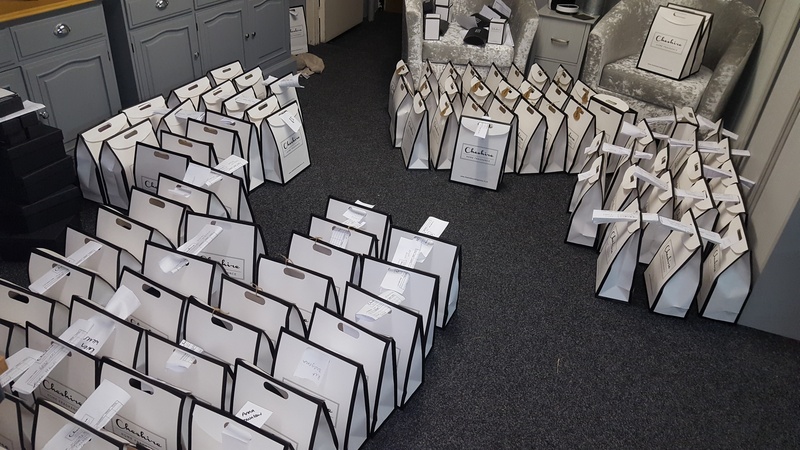 Orders awaiting collection – the showroom floor was filled around 5 times throughout December. In fact, I can’t quite believe just how far my products have travelled. Christmas gifts of wax melts, burners and scented candles flew off the shelves – quite literally – to some very far-flung destinations. I had orders shipped across to the Republic of Ireland and to Europe, including France, Sweden and Norway. Further still and I’ve had responses from delighted recipients over in the USA and Canada, New Zealand and Australia – the scents of Cheshire are going global! 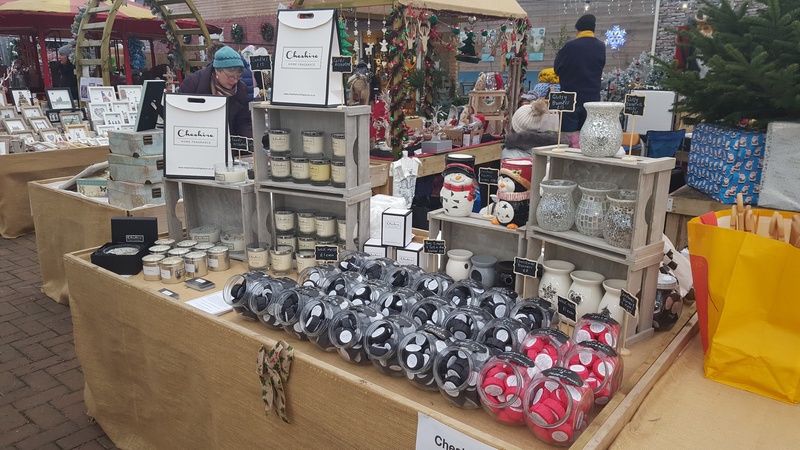 What’s in store for Cheshire Home Fragrance? It’s a new year and I am starting off full of hope for the months ahead. Just a week into 2018 and I’ve already hit my first milestone: surpassing 2,000 likes on Facebook! Once again, thank you for your continued support. That’s not all I’m hoping to achieve this year, though. Cheshire Home Fragrance has experienced such rapid growth recently that Allen and I have decided to designate the entirety of our shared showroom/office to my business. It’s become necessary to have a larger space in which to make more products if I am to keep up with demand – the new workstations have been ordered, along with plenty of other supplies, and I am excited to share a few snaps of the progress with you when everything’s in place! While I’m delighted with the fabulous feedback I receive from customers, I’m not one to rest on my laurels; I want to make sure that everyone finds a favourite fragrance in our range, so the line-up of fragrances I offer is set to grow in 2018. Get ready for some new scents to stimulate and soothe your senses this year – 18 new aromas are already on order and new products are soon to be launched. Keep up with all of our latest news on social media and watch this space for more announcements – we can’t wait to see what the rest of this year has in store!